So The Legal Genealogist is on the road (again) (yeah, what else is new, I know, I know), this time in Chicago where I have the honor of speaking to the Chicago Genealogical Society today. It’s going to be a ton of fun as we explore everything from 17th century thinking about law and women to 21st century concepts of DNA as part of genealogical research. But yesterday… oh, yesterday… yesterday I got to do something totally outrageous. I got to research (gasp) my family. My father’s family, to be precise. My German immigrant family that began to settle here in the Windy City sometime back in the late 19th century. But yesterday… oh, yesterday… yesterday I learned a little bit more. Yesterday, thanks to CGS President Stephanie Carbonetti, I got to go to the Newberry Library in Chicago. Although I was a bit like a kid in a candy shop, not knowing what to sample first, I managed to concentrate just long enough to think that one thing I really needed to look at was the Newberry’s set of Chicago telephone directories. It’s that building on the left with the green overhang that’s 1059 North Laramie. And to my genealogist-granddaughter’s eyes, it looks wonderful. I hope my grandfather enjoyed being a shopkeeper. I hope he loved the smell and the feel of the things he bought and sold. I hope that he had an absolute ball during the short time the deli operated. Because it was a short time. An all-too-short time. My grandfather couldn’t have known, when he opened the doors of that business, mostly likely in 1929, that the Wall Street Crash that year wasn’t a short-term phenomenon. 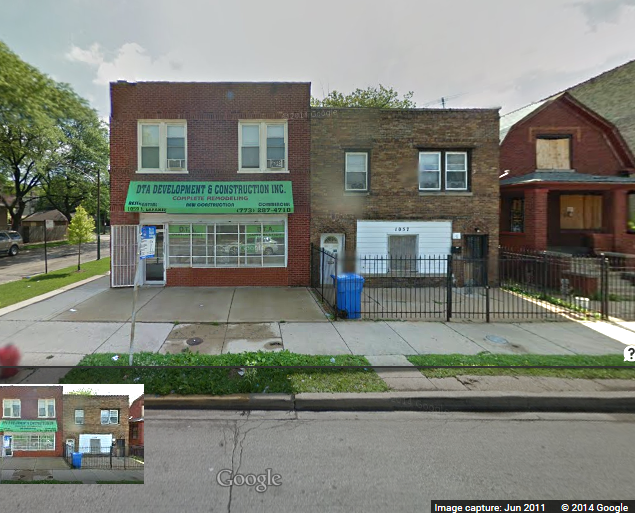 That its effects would deepen and spread and, eventually, wipe out a corner deli at 1059 North Laramie Avenue in Chicago. By 1932, there was no telephone listing for the Geissler delicatessen any more. There wouldn’t be a telephone listing for any Geissler again in Chicago until the 1940s. But for that brief moment, in that small shop, my grandfather ran a delicatessen. And yesterday… oh, yesterday… yesterday the telephone books in the Newberry Library brought it all to life. It’s those about whom we know so little that make finding even the smallest clue so rewarding. Good for you, Judy! Thanks, Dave! It sure was an exciting find. I believe I was at this building (or possibly the one to its right if it also once had a commercial use on the ground floor, as appears possible from the photo) in the late 1940s or early 1950s, when it was either a hobby shop or one of the fairly numerous small “corner” variety stores located here and there in the Austin neighborhood of Chicago. I, probably with a friend or more, remember walking there from where I lived, a little south of Chicago Ave. (which is 800 North), during one or more of the yo-yo crazes of the period, both to buy yo-yos (and replacement strings) and to attend periodic demonstrations by a Duncan Yo-Yo Co. representative. They were held out front on the fairly large paved area, where the guy performed all sorts of amazing maneuvers/tricks that we aspired to, which he tried to teach us. I remembered that John Hay School (public elementary school) was approximately across Laramie from the store, and indeed found it still there when I looked on the other side of the street using Google’s Street View. Do you think your grandparents lived in the apartment/flat above the store, as was common whether the space(s) were rented or owned? If so (or if they lived nearby), they might have attended a reasonably nearby church (or perhaps traveled to one already attended by relatives). Were they Roman Catholic or, perhaps, Lutheran? If Catholic, they might well have attended the nearby Our Lady, Help of Christians church (commonly heard and said by us kids as “Help-A-Christians”), in the 800 block of N. LeClaire Ave., two short blocks east of Laramie and a couple long blocks south. There was also a parish elementary school, with a huge enrollment in the post-WWII years. I think that church started as predominantly Irish around the turn of the 20th century but later became very diverse. The Austin neighborhood was loaded with Lutheran churches, originally connected with one or another immigrant nationality, from German to Swedish to Danish, Norwegian, Finnish, and more. The first German-connected church in the area that came to mind was St. Paul’s-Austin (still in existence, along with its school). It was at Menard (5800 W.) and Iowa (900 N.) (Laramie is 5200 W.) This church was and may still be affiliated with the Missouri Synod. In fact, I was married there in the 1960s, though never a member. I believe this church still had one weekly German service at least well into the 50s. I just looked up a bit about Trinity Lutheran Church, at about 1400 N. Laramie (at Hirsch), which I vaguely recalled as having a German origin, but it was part of the United Lutheran Church synod originally, not Missouri, I think. The United group became part of the merged ELCA (Evangelical Lutheran Churches of America) later. The congregation evidently went out of business there (so to speak) in the late 1970s, but its records are at the Newberry Library. The building is now occupied by a Baptist church. For whatever it might be worth (probably nothing), I went to high school with a Schreiner (Luther H.S. North, not in Austin but considerably northwest in Chicago). Sounds like your finds were even better, Debi! Cool!